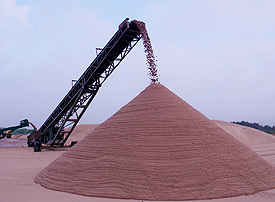 Hutcheson Sand & Gravel mines and processes a comprehensive range of construction aggregate materials from extensive reserves of high quality granite sands, stone and rock. Our People really are Our Greatest Asset. In addition to the company’s substantial aggregate reserves, the Hutcheson’s crew offer many years of cumulative experience in soils and aggregate materials processing and handling as well as a relentless dedication to product quality. Strategically located on the southern edge of the Canadian Shield, Hutcheson is uniquely situated to supply aggregate products throughout Muskoka and central Ontario, as well as to distribute them into southern Ontario and New York State. Hutcheson’s well established focus on specialty products and quality control continues to create new market opportunities for the company across Canada and around the world, but its roots are still firmly fixed in its traditional regional market for construction aggregate materials in the District of Muskoka and Central Ontario.